I have a 2 yr old (it’s been in the house for 2 yrs but outside in summer for 3 months)red flower hibiscus plant. I would like to plant in the ground. I live in Portland Or. Will it survive the winter if I put it close to the house and out of the weather? Lots of hibiscus do fine outside all winter. Some are tropical. My advice is to get a hardy hibiscus, like the large dinner plate hibiscus. Thanks Mike, your suggestions are simple and very helpful. If you have suggestions for a huge front yard, please share it.Thanks again! just got some Forsythia cuttings so looking forward to getting them struck. only days away now till our 1st plant sale,. I enjoy your videos and have put in my new e-mail address, but the e-mails are still coming to my old address. Please note new address is: [email protected] (the old e-mail address was [email protected]. I will no longer be having my e-mails forwarded soon so I am writing you again. Thank you. The first time I input my new address I did it on the site you had requested me to. Love your videos!! will Forsythia’s grow in Hawaii??? , they are so very beautiful when they bloom. Sounds like a doable project. My question is can you use this method for other bushes besides forsythia? 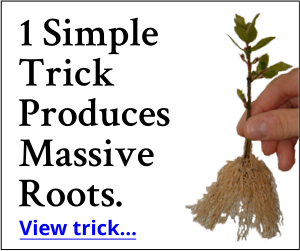 Yes, Almost any plant that can be rooted as a cutting can be layered ! Example of plants that I have layered, mint, gardenia , azalea , tomato , grape vines, strawberry. Another thing that you can do is to layer into pot, that way you don’t have to disturb the new roots, just cut off from parent plant and new plant is already potted ! Mike, my question is can you prune and shape a japanese maple that has leaves on it without killing it? Its a new container tree that hasent been properly pruned yet . Any advice will be apperaciated. luv forsythia. I don’t have one on our property yet. Good complete lesson! I’m gonna try this soon. Thanks. Hi Mike! I did not know about this type of propagation. All of the information you give is very helpful. I’m glad I receive your emails. Thanks for passing on your knowledge. I love learning your gardening stuff! I haven’t gardened in years, and am getting back to it now. I need all the help I can get – especially since my soil is solid clay. Sooo hard to work with! You are a great help. Thanks! You have such great information. You really know what you are talking about! Hey, the video worked this time! I don’t know what you did (I am interested though), but thanks! Can you start a Viburnum the same way as you did this Forsythia? Thanks for all the tips; I bought the Action Hoe and just love it!